heavy duty cranes, cranes manufacturer, cranes exporter, industrial cranes, EOT cranes, single girder eot crane, double girder eot crane, material handling crane, electric crane, electric cranes, electric crane dealer, electric crane supplier, eotcranesindia, indiamart. Thanks for the nice and good work and after sales service for supplied EOT Cranes. This is to certify that m/s. 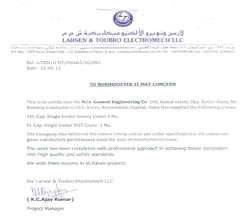 Ganesh engineering co.Has supplied the following cranes10t. Cap. Single girder gantry crane- 1no.5t. Cap. Single girder eot crane-1 no. The company has delivered the cranes timely and as per order specifications, the cranes are given satisfactory performance since the date of installation of crane. The work has been completed with profession approach in achieving timely completion with high quality and safety standards. We wish them success in all future projects. To view the testimonial, Kindly view the image. This is to Certify that 2 No. of 25t+25t. 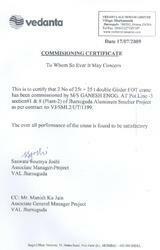 Double Girder EOT Crane has been commissioned by M/s. 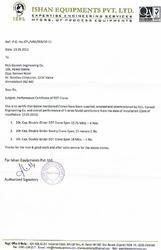 Ganesh engineering co. At pot Line-3, Section 1 & 8, (plant-2) of Jharsuguda Aluminium Smelter projects as per contract No. VJ/SML2/UT/1199. The Overall performance of the crane is found to be satisfactory.